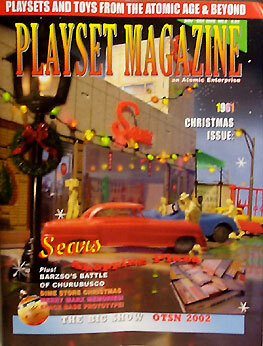 It's Christmas, 1961 in this issue, as we feature: The assembly of a complete, flat tin, Sears Playset with several full color photos! A "Dimestore Christmas" catalog special - in full color! Many selections include Mattel Burp Gun, Lido Knights, Farms, Tinkertoys, American Bricks, and more. Marx Space Base Prototype Vintage Christmas items at Koch's Korner and much, much, more!